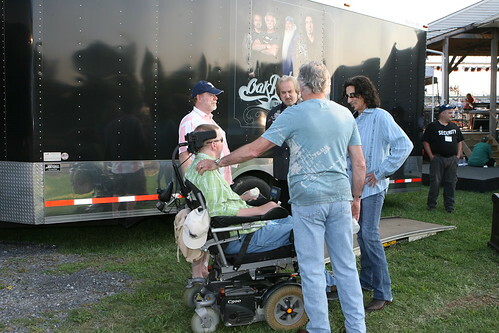 The Oak Ridge Boys ran into local Iraq war veteran and local hero Bunky Woods backstage before their Aug 2, 2009 concert at the Warren County Fair. The band hit it off with Bunky and chatted so long they were actually a few minutes late for their show! The legendary country performers asked Bunky to let them know if he ever came near one of their shows so they could bring him in as their guest. After their first song, Oak Ridge Boys tenor Joseph Bonsall mentioned meeting Bunky to a happy crowd and then the group sang “American Made,” one of their biggest hits.